The pressure will all be on Rangers on Tuesday against St Johnstone suggested the Perth side's manager after they ended a run of league defeats. 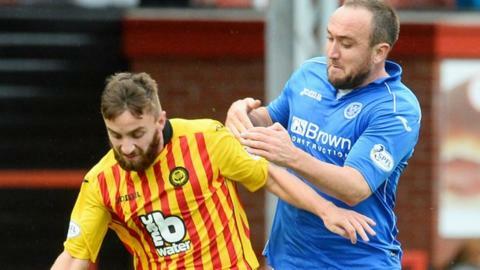 St Johnstone avoided a sixth straight reverse in the Scottish Premiership after a 0-0 draw with Partick Thistle. "We've got to take the positives out of the game and look forward to Tuesday night," said Tommy Wright. "And I do believe the pressure is all on Rangers and we'll go there and hopefully put on another performance." Rangers sit second of the Scottish Championship after their 3-0 win away to Dumbarton, while Saints remain ninth in the top flight ahead of their League Cup meeting in Glasgow. "Away from home, we are probably doing that we bit better this season where last season it was until after Christmas or January our away record was really poor," said Wright. "The players know that, at both ends of the pitch, we have been below par and that's why we've been on the run we've been on." "So it is maybe a good thing that the game is at Ibrox. "We're always optimistic after defeats that we can go on and win because the next game is always the most important one and we always focus on that." Wright insisted he could take more from the match against Thistle than a shared point. "It is a good point particularly in the run that we've been in," he said. "The conditions were difficult, there was a lot of wind. It didn't help the game. "But, overall, we were pleased with it and we had more clear-cut opportunities in the second half and we could have sneaked all three points. "Where we are at the minute, I'm really pleased with the performance, pleased to get a clean sheet." Wright also believed his side had created the better of the chances during the match at Firhill. "We had a very good opportunity with Lee Croft in the first half and a couple of opportunities in the second half where maybe a better ball and Murray Davidson gets a good save from Scott Fox late on, so we perhaps could have sneaked the win," said Wright. "The players know that, at both ends of the pitch, we have been below par and that's why we've been on the run we've been on," he said. "We just have to start working on creating opportunities and making more of the opportunities we have. "I don't think there's been a lack of confidence. People might think that, but I've been working with them every day and they are still as bubbly as they were last season. "We are just on a run when everything that could go wrong has gone wrong. "What I know is that there is a good squad there and they will get better."